We’re all victims of the computer vision syndrome, visiting social media accounts at work, inactive by sitting at our stations all day or in some manner abusing and impairing the performance of our bodies because of excessive use, or should we say misuse, of computers rooted to desks. But this problem, since time immemorial, always seems to draw a who-has-the-time-for-exercise response! Observing the sedentary lifestyle trend, Prof. Daniel Vogel, William Saunders and a team of researchers at the University of Waterloo’s Computer Science School have created the Tap-Kick-Click. 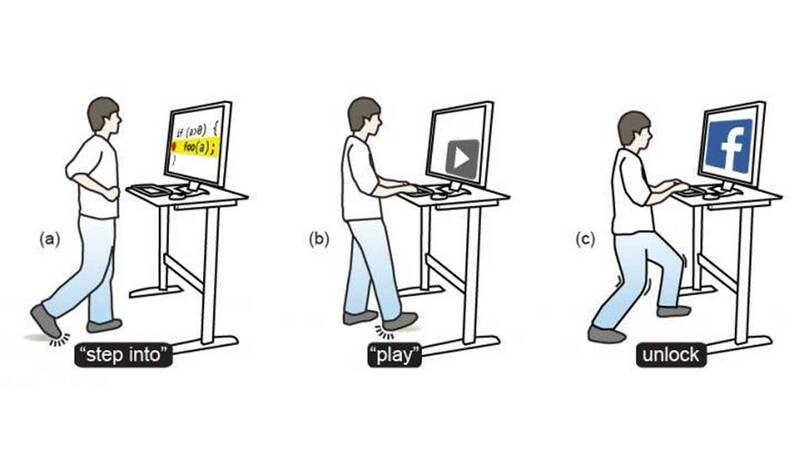 As the name suggests, the concept encourages users to be physically active by means of interactive yet discreet foot movements such as tapping, kicking and jumping or a combination of these, to complete simple operations on their computers while standing at their workspaces. The whole process is monitored by Kinect cameras placed under the table and special devices attached to the shoes, with pressure sensors on the toes and heels, to be activated for mobility. Sure sounds like fun but hello hard work! This setup not so much completely replaces the mouse and keyboard as much as it encourages workers tied to their devices to just move. This innovative alliance between physical activity and computers, similar to treadmill and standing desks, in the digitalized world, takes healthcare a long way forward in decreasing risk of disease such as coronary attacks, diabetes, anxiety etc and obesity caused by lethargy and inaction, apart from nourishing manual and mental capacity and relieving stress.